The Search function in Windows 7 actually works. Most searches begin in Windows Explorer, but you can also use the Start menu to begin a search. When you click the Windows 7 Start button, you can immediately type a keyword in the Start Search bar and have Windows 7 look for the text you type. 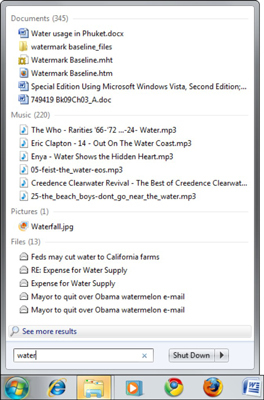 For example, if you tell the Start menu’s Search bar to look for the word “water,” Windows 7 consults its index and knows more or less immediately that your computer has a bunch of matching entries. 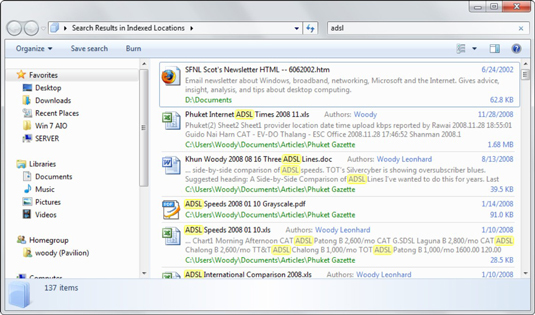 Windows 7 searches the index and provides you with a list of results automatically sorted by type. If the results include any programs or Control Panel applets, Windows 7 runs the top program on the list when you press Enter. If the results don’t include any programs, pressing Enter throws you into a simple search, covering everything in the Windows 7 search index. You can customize the Start Menu’s options to limit the search locations if you want to speed up the Start Menu search process. The following image shows a full search that started in the Start menu. One advantage of starting in the Start menu Search bar is that the search will cover all indexed locations — it won’t tied to a particular folder or library.